A Southern plant, Wall Speedwell is found in the N. Temperate Zone in Europe, N. Africa, N. and W. Asia, Himalayas, and has been introduced into America. It is unknown in early deposits. This plant is found in all parts of Great Britain as far north as the Shet-lands, and ascends to nearly 2000 ft. in Yorks. It is found in Ireland and the Channel Islands. Wall Speedwell is an arenophilous plant, which grows on wall-tops, at the sides of paths, on sandy, open ground, as at the seaside, on gravel drives, and other dry habitats, being xerophilous. With it grows Vernal Grass, Sandwort Spurrey, Rue-leaved Saxifrage, Mouse-ear Hawkweed, and other plants, A small, erect, sometimes branched plant, Wall Speedwell has a rigid habit which marks it off from others of the group. It is a downy plant with the lower 5 leaves stalked, heart-shaped, purplish below, blunt, flat, notched. The upper leaves are stalkless and twisted. When it grows on walls the leaves at the base are purple. The hairs are jointed, and arranged on the lower part of the stem in two rows. The numerous flowers are slightly stalked, in a spiked raceme, with long, linear bracts exceeding the flowers. The flowers are deep blue, and fall at the least touch. The calyx has lance-shaped sepals, oval, hairy, covered with glands; the corolla is wheel-like, with a short white tube. The limb is divided into 4 segments. The capsule is flat, inversely heart-shaped, pale-brown, and the seeds are oval, flattened at the border, with a depression down the middle. The stem may be 3-9 in. high. The flowers open in April, and flowering continues till July. The plant is annual, propagated by seeds. 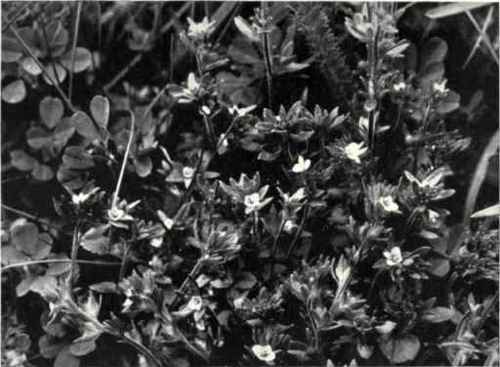 The floral mechanism is closely similar to that of V. hederoefolia, but the corolla is very small and pale-blue with a white eye. The style is very short, and the flowers are in a terminal raceme. The capsule is winged, and dispersed by the wind, and the seeds, being flat, are also adapted for this.